Like many other things, the word Momofuku first entered my vocabulary when I moved to New York City. I had never heard of it before, and initially, it sounded like a word that my mother would scold me for saying as a child. (She also didn't like me using the word "crap" so I am not quite sure what that means.) My roommate Brad, among others, kept talking about this amazing restaurant in the Lower East Side. It was expensive. But amazing. Just like every other restaurant in New York City. So, on November 6, 2011, I brought family friends down to the LES to share the Momofuku experience with me. I can pinpoint the exact date because it happened to be the same day that psychos were running rampant throughout New York City...aka running the ING New York Marathon. And by the way, I hope someday to be included in that group of people I just referred to as "psychos!" Yes, I only went to Momofuku once, but that is all it took. But as that is not yet a feasible option, or if it is, someone please tell me, I fell victim to the phenomenon known as impulse shopping. I saw the Momofuku cookbook. The Momofuku cookbook was in hand. To the checkout I went... $45 later, I was the proud new owner of a brand new cookbook! For months I have been trying to decide when to attempt to make something from the cookbook. I was half afraid that it wouldn't live up to the real deal, and half afraid that the recipes would be way too difficult and I would fail miserably. I have never ventured too deep into the Asian cuisine realm. I knew it would be a challenge. A forewarning to tonight's post...as amazing as this food was, I am not going to post all of the recipes. The extent and numerous components that are required to go into these dishes is time-consuming. It is not that the recipes are very difficult, but we did take 2-3 days to make the ingredients. Angie was also kind enough to drive over an hour away to go to Mitsuwa, a Japanese marketplace, to find ingredients that most grocery stores had never heard of. Was it worth it in the end? Yes. Did it take a lot of time and effort? Absolutely! The recipe for the Apple Soju cocktail does not come from one of the Momofuku restaurants, but instead is simply inspired by them. I fell upon this delicious drink on Momofuku for 2, a food blog devoted to making every recipe in the Momofuku cookbook. The recipe says to allow the matchstick apple slices to macerate in the soju for 30 minutes. While it was good, I would allow the apples to sit in the soju for even longer, say 2-3 hours, to allow the flavors of the apples to fully mix with the soju. 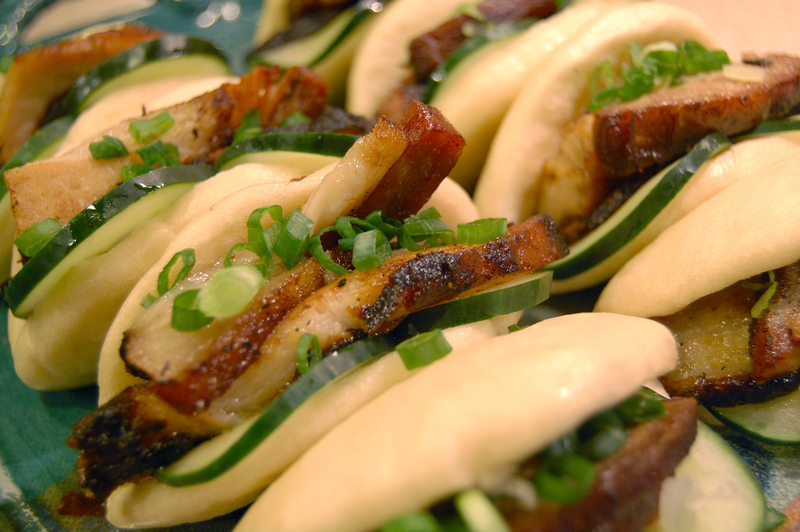 The pork buns were perhaps the one recipe that I was most excited to attempt. My concern, however: YEAST. I have somehow managed to go through life without ever having to make yeast bread. It may be a beautiful thing to see something come to life to create a delicious bread, but I was terrified. I have only ever heard horror stories. While my dough did not double in bulk during the first rising (I immediately called Angie, knowing that I had ruined the evening...the steamed buns had failed, the dinner had failed...), somehow I made it work. I made yeast steamed buns! Watch out culinary world, there's a new baker in town! The Momofuku Ramen was the most complicated aspect of the meal. Ramen broth. Taré. Pork belly. Pork shoulder. Nori. Fish cakes. The broth was time-consuming. The ingredients were exotic. The results were well worth the effort put in, so that being said, if you truly want the recipe for the ramen, feel free to contact me! There will be multiple recipes needed. The dessert was another recipe that did not originate at a Momofuku restaurant. Angie searched recipes, looking for something that would compliment the meal that we had prepared. She fell upon a tapioca pearl pudding recipe on Epicurious. A word of wisdom from Angie: "The tricky part is the tapioca. It's very sticky if you over cook it and then rinsing is impossible. The minute it looked like it was about done, I rinsed it before it had a chance to coagulate too much." The dessert needed a little something to jazz it up - while the taste is amazing, the appearance is less than fantastic. So, we topped each bowl with a single nasturtium - an edible flower that would add a little splash of color. Again, if you are interested in making the full meal on your own, you can purchase the cookbook at just about any bookstore, or contact me directly and I will send the recipes your way! Cut the apple into matchsticks then put in small pitcher and stir in soju. Let macerate, covered and chilled, at least 30 minutes. Fill glasses with ice and strain about 1/4 cup soju into each glass and add some apple pieces and a wedge of lime. Top off the drinks with the tonic water and enjoy! Combine the yeast and water in the bowl of a stand mixer outfitted with the dough hook. Add the flour, sugar, milk powder, salt, baking powder, baking soda, and fat and mix on the lowest speed possible, just about a stir, for 8-10 minutes. The dough should gather together into a neat, not-too-tacky ball on the hook. When it goes, lightly oil a medium mixing bowl, put the dough in it, and cover the bowl with a dry kitchen towel. Put it in a turned-off oven with a pilot light or other warmish place and let rise until the dough doubles in bulk, about 1 hour 15 minutes. Punch the dough down and turn it out onto a clean work surface. Using a bench scraper or a knife, divide the dough in half, then divide each half into 5 equal pieces. Gently roll the pieces into logs, then cut each log into 5 pieces, making 50 pieces total. They should be about the size of a Ping-Pong ball and weigh about 25 grams, or a smidge under an ounce. Roll each piece into a ball. Cover the armada of little dough balls with a draping of plastic wrap and allow them to rest and rise for 30 minutes. Meanwhile, cut out fifty 4-inch squares of parchment paper. Coat a chopstick with whatever fat you're working with. Flatten one ball with the palm of your hand, then use a rolling pin to roll it out into a 4-inch long oval. Lay the greased chopstick across the middle fo the oval and fold the over onto itself to form the bun shape. Withdraw the chopstick, leaving the bun folded, and put the pun on a square of parchment paper. Stick it back under the plastic wrap (or a dry kitchen towel) and form the rest of the buns. Let the buns rest for 30-45 minutes: they will rise a little. Set up a steamer on the stove. Working in batches so you don't crowd the steamer, steam the buns on the parchment squares for 10 minutes. Remove the parchment. You can use the buns immediately (reheat them for a minute or so in the steamer if necessary) or allow to cool completely, then seal in plastic freezer bags and freeze for up to a few months. Reheat frozen buns in a stovetop steamer for 2-3 minutes, until puffy, soft, and warmed all the way through. Bring water to a boil in a heavy medium saucepan, then stir in tapioca. Simmer, stirring often, 10 minutes. Cover and remove from heat. Let stand until most of pearls are translucent, 25 to 30 minutes. Drain syrup from lychees into a small saucepan and add sugar, zest, ginger, and 1/4 teaspoon salt. Simmer, stirring occasionally, 10 minutes, then remove from heat and let stand 5 minutes. Coarsely chop lychees and put in a bowl with mango. Drain tapioca in a colander and rinse under cold water until cool, then add to fruit. Strain syrup though a fine- mesh sieve into fruit. Stir in lime juice and let stand 1 hour for flavors to blend.